Here we are, another friday achieved!! Please join me and all the other fraggers on Friday Fragments! My parents got of their week long cruise and I just wanted to cry for them… in joy! They had the best time on Holland Cruise Lines. They were catered to like royalty and my father had every kind of buffet available to him possible!! They were going to wander back through the Everglades before heading back to the frigid midwest. My father is a letter carrier and has kept many phuysicslly demanding jobs over the years, so I am especially thankful to the cruise group for giving them this great opportunity. They waited and saved for 35years to get this vacation!! I am so glad it was well worth it for them!!! (X) Been on the opposite side of the country All the opposite sides—DITTO! (X) Made prank phone calls BUT I AM SORRY I DID!! Really, Kay? Because I think calling Jesse up and making him take a Teen Magazine survey, and then calling him back as us and asking him if he had been asked to take a Teen Magazine survey is actually pretty FUNNY! (X) Laughed until some beverage came out of your nose SO MANY LIQUIDS HAVE COME CRUISING OUT OF MY NOSE!!! (X) Ever steal any traffic signs DO STREET SIGNS COUNT??? Of course! We are having tooth issues in the house this week. My children have my problem…I had adult teeth grow in on top of my baby teeth while the baby teeth had no intention of getting out of the way! My duaghter is working very hard at wiggling hers and solving the problem herself. Yet my hubby (type A. take charge kind of guy) told them that by Friday if all the teeth weren’t gone, he was going to pull them out with plyers. My duaghter got upset, but my son (who has 3!!!!!) busted up crying. Not the best ‘bedside manner’ in this situation. Have you guys had to either do this or had your own teeth pulled out? My folks remember doing it once to me at home and letting the dentist do the others. Speaking of the dog, I got a huge kick out of our playdate this week. I was enjoying getting to know a fellow mom from church. We shared all manner of pleasant conversation. Her girls love the IDEA of a dog, and were so very happy to pet our pooch… as long as he was not looking at them. Considering he stood taller than both girls it is fully understandable. As they were leaving one of the girls were talking about him and playing outside. I told her all about how Swissies are the cart horse of Switzerland and about his harness and sled pulling ability. She was so excited I am sure in her brain is set in stone a playdate next winter in their open field for our pooch to give sleigh type rides. And I CAN’T WAIT!!!! Just stopped by from Friday Fragments and love your blog. I can’t wait to come back for another visit. That comic is awesome! i have to ditto your comments about mom & dad’s cruise! they have worked so hard to earn this vacation, they deserve the royal treatment! Yuck on the tooth issues. I have some horrible stories of tooth pulling, have I ever told you? pic is too funny!So glad your parents got this chance! Remember Reagan being terrified of Heidi? Hee hee, you’d never know it now! I just learned what a Swissie is. My brother has one — I think he said it’s called a red swissie, even though it looks blond. That dog is GI-normous, but the sweetest dog you’d ever want to meet. Yeah!!! You joined the Fragmenters! You have hada week like mine! I was so tired today with snow and the events of the week I didn’t get my fragments up. Sigh…. I hope you are doing well!! I ❤ your commetns on my blog. Always so nice!!! And I LOVE your layout!!! Wow! I have often thought about how the invention of caller id has rendered an end to the prank call, which, I guess, is a good thing, but it still makes me sad… it was such a rite of preteens sleepover passage! 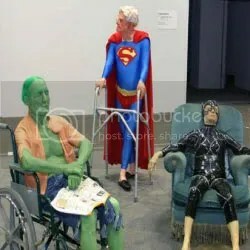 The retired super heroes is a riot! I totally understood the Thomas the Train conversation!My teeth & my kids teeth are pulled by the dentist. Some things are best left to the pros! lolStopping by from Friday Fragments.